What is Happening in Healthcare Settings Today? What is a healing environment? As you may have experienced yourself, most of the hospitals and clinics built in the 20th century were not designed for the healing of patients and comfort of family. Consider, for example, how the focus of many hospital rooms is the somewhat frightening medical equipment, while the halls throughout are painted in practical, but depressing hospital green with noisy, but easy-to-clean linoleum floors. Some people have even compared these settings to prison: an institutional environment with few concessions to aesthetics, where furthermore, personal clothes and effects are taken away and the inmate/patient has few choices about what happens. It is often a dehumanizing environment that runs counter to healing. However, this is beginning to change as healthcare moves towards a more patient-centered and holistic model. Increased patient safety, for example reduced falls and medical errors. The Institute of Medicine (IOM) has published a number of reports that stress the importance of improving quality and safety in healthcare settings. Research demonstrates that design that is patient-, family-, and staff-focused does much to meet IOM goals and improve quality and safety. What else is driving the change? Currently many hospitals and other healthcare facilities, such as long-term care facilities are being constructed to replace those at the end of their life and to meet the demand as the baby boomer population grows older. Many of these are designed according to a new understanding of the healing environment and the research behind evidence-based design. Clinics are also beginning to change, not least because the American healthcare system can no longer afford a system that focuses on disease-based care. Healthcare is beginning to recognize the central place that wellbeing of mind, body, and spirit plays in health. Springing from this, clinics are realizing that a healing environment can contribute greatly to the wellbeing of patients coming in for procedures or to manage a chronic disease. In addition, as healthcare consumers become more aware of their choices, healthcare organizations hope to attract their business with a welcoming environment. The physical setting is the patient's first impression of a healthcare facility and one of the most important factors in the patient's perceptions of the quality of care and their overall satisfaction. The Center for Health Design is a non-profit research organization that advocates for change in healthcare design. 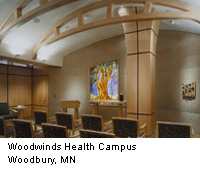 Its mission is to "transform healthcare settings into healing environments that improve outcomes through the creative use of evidence-based design." The Center created an agenda for research in this area, out of which grew the Pebble Project, so called because the research conducted in individual hospitals has a ripple effect throughout the healthcare industry as results show important benefits. The Planetree research shows these changes result in an increase in patient satisfaction and decrease in patient length of stay. They also result in increased staff retention and ability to recruit new staff. What changes are happening in the physical environment? One of the biggest trends in new hospital construction and renovations is the move to single rooms. There are many reasons for a hospital to move exclusively to single rooms, not the least is the greatly reduced risk of infection. Single rooms remove the roommate as a source of infection and are easier to clean. In addition, some evidence indicates that staff wash hands more often in single rooms. The evidence for the benefit of single rooms is strong, so if you have any choice in the matter, get a single room. Here are other trends in new and renovated hospitals and the reasons behind them. These rooms allow a patient to stay in the same place throughout their hospital stay-from their admission as a critical care patient to their release-instead of transferring rooms multiple times. This reduces medical errors significantly and enables the development of healing relationships because patients in theory have the same nursing staff during their entire stay. It also reduces the uncertainty and discomfort of moving and helps friends and family become comfortable with the space and facilities. Many facilities are now adding indoor gardens, aquariums, and landscapes to bring nature into the environment. Extensive research demonstrates that even a short exposure to nature reduces patient stress considerably. Artwork is also a therapeutic distraction. Research shows that natural scenes are restorative, and are most liked when they have a depth perspective and an element of mystery. On the other hand, ambiguous and abstract art can be frightening, especially when people are ill. The trend is to natural light and control over lighting. Research indicates that patients in rooms that receive more sunlight may be less depressed and have shorter stays. In addition to natural light, a trend is to offer softer ambient lighting with specific lighting sources for staff tasks and for patient control of lighting levels. 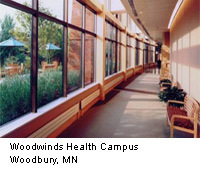 Noise reduction is essential to reduce the environment stress that noisy hospitals produce. Hospitals are attempting to both reduce the noise sources (for example by reducing or eliminating overhead paging) and to improve sound proofing with sound-absorbing ceilings and carpeting. Carpet alone can reduce ambient noise by up to 70% (Leibrock). Designs are incorporating features to improve staff effectiveness. For example, decentralized nursing stations place nurses closer to patients, so they spend less time walking, have more time with patients, and are better able to observe patients at all times, which is proven to reduce patient falls. Another example is more organized, better lit medication rooms with fewer distractions, which result in fewer medication errors. 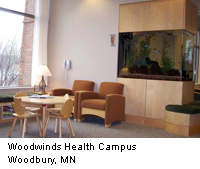 Wayfinding elements, such as color, images, and signage, to better orient patients and families and help them find their destination. This reduces the disorientation and resulting stress in patients and families. Hospitals are offering a variety of social spaces, such as lounges and waiting rooms to accommodate various social functions. Also desirable is comfortable, moveable furniture in small groupings to facilitate socialization. What about changes in the relationships with caregivers? One of the key factors driving changes in healthcare is the concept of patient-centered care. In this new approach, patients are treated with dignity and their needs for privacy and individual expression respected. Likewise, patients are informed about their clinical status, progress, and prognosis, and their test results and treatments are clearly explained. Patients and their families are seen as partners in decisions about treatment and care, and their concerns are addressed. They are offered options including access to complementary therapies and healing practices. What are some other changes? Increasingly hospitals and other healthcare facilities are offering an integrative care approach, where complementary therapies are available to help patients cope with the effects of their disease or condition. 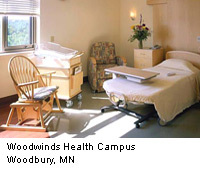 For example, Woodwinds Hospital in Minnesota offers massages to women in labor to promote relaxation. At Abbott Northwestern Hospital in Minneapolis, nurses use guided imagery with patients before surgery to reduce emotional symptoms such as anxiety and fear, and physical symptoms such as rapid breathing, rapid heart rate, and high blood pressure. At North Hawaii hospital, nurses offer Healing Touch both before and after surgery. It is not uncommon to find various complementary therapies available at hospitals, either as part of nursing care, or as an extended service. Therapies offered include: Reiki, Healing Touch, aromatherapy, massage, acupuncture, imagery, music therapy, and other creative therapies, such as art therapy. Another beneficial change is a renewed recognition of the importance of nutrition. Planetree hospitals offer patients a menu that they can order from when they are hungry, and the healthy, tasty food is cooked to order (as opposed to hospital meals delivered at set times). Is this a healing space? 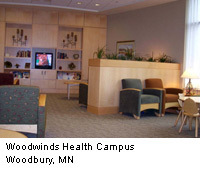 Look at these modern healthcare environments. Which ones are most appealing? Why? What Is Healing About This Hospital? Which of these healthcare environments appeals to you?